The advertisements for the new Daisy pattern focused on changing market trends toward bright and cheerful colors. A set of juicers was released to accompany the Daisy pattern, but the design is actually of bright orange and lemon slices, not quite matching the Daisy pattern. Daisy is one of the patterns used on the clear lids of the dishes and not just the dishes themselves, some of which have no pattern at all. “New Daisy PYREX Ware! A Corning Guide to adding a splash of sunshine to your cooking, serving and storing. You get a whole bouquet of Daisies…everything from oval casseroles, bowl sets, refrigerator and storage sets to coordinated pitchers and juicers….Go Daisy picking today.” This 1968 magazine ad for the new Daisy pattern illustrates a trend toward bright and happy colors. 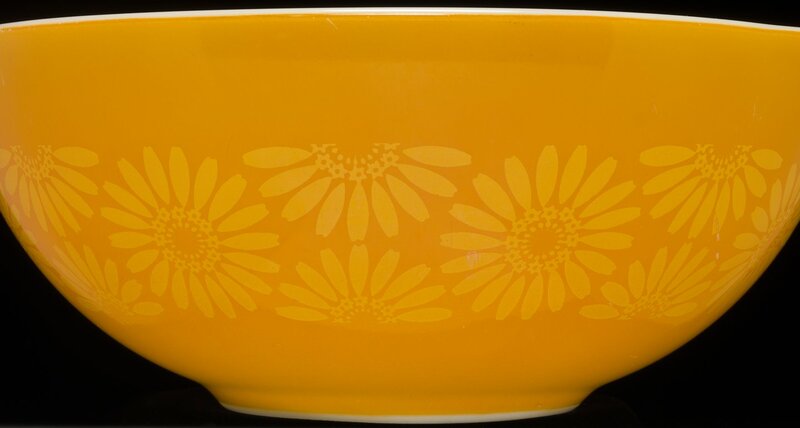 Released in 1968 in sunburst colors, the Daisy pattern only appears on the 442 and 444 Cinderella mixing bowls while the remaining bowls and casseroles were solid shades of yellow and orange. Daisy, instead, appears on the clear glass lids of the dishes until 1972 when the clear lids were replaced with opal lids, still with the Daisy design printed on top. While there were no Tabletop Accessories with the Daisy pattern it could be purchased on a wide array of products including the more standard casserole and bowl sets as well as on the three-piece Bakeware set (330-39) and the small 10 oz. or “pixie” casserole (700-39), both released in 1971. A set of juicers could be bought to accompany the Daisy design, but the juicers were printed with slices of oranges and lemons not Daisy, although still in the same vivid shades of yellow and orange. Daisy was discontinued in 1973.